Julian Wilson knows the top of the podium well. The Sunny Coast native has won at Teahupoo, Pipe Masters, and during his sophomore year on tour in 2012 he clinched a victory at the Rip Curl Pro in Portugal. But his win to start the 2018 WSL season at the Quiksilver Pro Gold Coast was different: this time, he was a father, and this time, the chips were stacked against him. Wilson was just five weeks into his recovery from a devastating shoulder injury sustained while mountain biking. Many were shocked he didn’t withdraw due to the injury. Following his fireworks final against fellow Aussie Ace Buchan, Wilson couldn’t even raise the trophy over his head. Instead, he balanced it on his shoulder and grinned ear to ear. Wilson redefines the phrase “dad strength” and the certainly the term “dad bod.” As such, we decided to take a look Wilson’s philosophy on fitness, nutrition, and mental strength in the first installment of our new series Champs on Health. Wilson is a generally easy-going guy, so it makes sense that he’s flexible on the foods he eats as he traverses the globe. As long as it fuels his body and doesn’t slow him down, he’s into it. 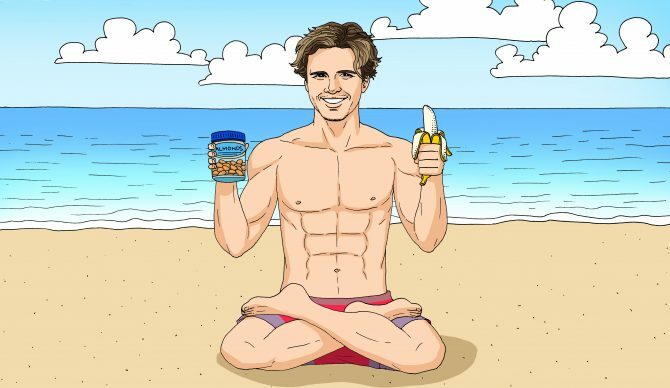 Julian Wilson keeps his pre-heat food intake super simple and small by grinding on energy-packed nuts and fruit packed with potassium to help delay fatigue and muscle cramps. “I eat bananas and almonds. That’s pretty much what I go to,” he said. Following his event win on the Gold Coast, Wilson talked about how his wife, Ashley, went through her first pregnancy and birth with their new daughter Olivia. It put things in perspective – making the painful rupture in his AC shoulder joint seem small. For Jules, the healthiest way to live is through a quiet, simple life surrounded by the ones he loves. He said a balanced life with priorities in order is more important than ever. Stay tuned for our next installment of Champs on Health with Lakey Peterson.